Segregation, Good Schools, and Homebuying in The North | Black. Bunched. Mass. Mom. Looking for a home is nothing like the fun that House Hunters and Property Virgins on HGTV makes it look like it’s supposed to be. I wish I had a lovely realtor out there to help me out, showing me awesome properties and helping me negotiate. I’m getting none of that. In the two weeks since we’ve started our house hunt, I’ve talked to one realtor who, upon hearing our budget, tried to sell me a property that has been abandoned for 12 months and has a toilet in the middle of the basement. She then told me that we’re at the “bottom of the market” and we probably won’t find anything. She then had the audacity to call me on Sunday night and leaving me a message, talkin’ ’bout “I lost all of your information. But I have your e-mail address and your phone number. I’d like to put you in my MLS system.” So she did. We’d found another person already. I e-mailed her and was like “We are actually going with another realtor. Thanks.” When I went to take my name out of her system, she had spelled my name wrong and everything. Wow. I mean, I know that I can’t buy a million dollar property, but you can treat me like I’m worth something, right? Jesus. So now I have a new realtor who is is nicer, but hasn’t been attentive. I get it. There are houses here in the North that go for millions of dollars, especially in the towns where we are looking. We’ve got a tiny budget (in comparison) of 300k. That’s not a little bit of money. That’s still a good commission for somebody. Can you at least call me or e-mail me or suggest some open houses for me? It’s so frustrating. See the pattern? Get the picture? Where are all of the people of color!?!?! Now, for those readers who are not from The North, let me explain why this is very annoying. You see, all four of those towns are in the same county. 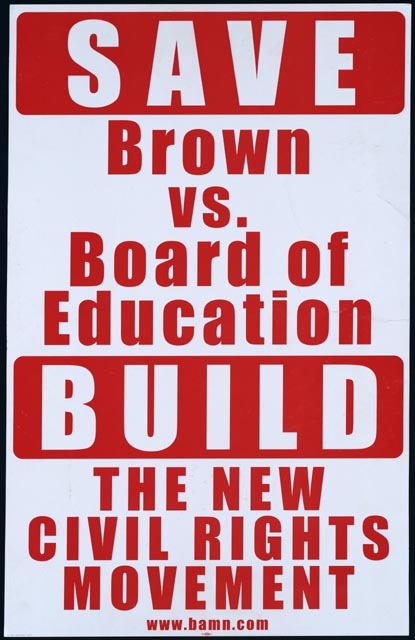 If you are from anywhere outside of New England, you expect school systems to be governed by county not town. Well, not in New England. Here, it’s the town that is the major unit of local government, not the county. Thus “Town A Public Schools” rather than “County A Public Schools.” So if I want my kids to go to a great school district (Town A High School is number 7 in the country for Math and Science), I need to move into one of these towns. The problem with that? There are no brown folks living in these towns. It’s segregation at its absolute worst. It’s like Brown v. Board never freaking existed. All of the Black/Latino folk live in very concentrated neighborhoods in the Boston/Worcester/Springfield cities, where the schools aren’t that great, and where the property values are low (or hyper-gentrified, and thus out-the-box expensive. But those people send their kids to the various private schools in the area). I spent my undergraduate and graduate career studying why segregated schools are bad for everyone, not just kids of Color, but white kids, too. No one wins when we aren’t learning together. That being said, I can’t express to you how utterly scared I am to enroll my boys in what will essentially be an all-white school district, despite the fact that I know that they will get a world-class public school education. I can’t afford to send my boys to private school K-12 (and they would be segregated, too!!!). My husband and I, in Maryland, got fantastic public school educations in integrated schools. We firmly believe in public school education, and I firmly believe in the importance of integrated learning. It is breaking my heart that they won’t be able to have both. Now, yes, my boys are bi-racial. They are half-white–to some, they even look white (until I cut their hair…)–so does that make it better? Should that make it easier for them in an all white school district? No. Because being in an all-White school district, but as being in an all-Brown school district narrows their world view, distorts their ideas about collaboration with other races, privileges them (puts them at a disadvantage) when thinking about themselves in relation to others and the world, and isolates them from reality, which is a fully integrated and collaborative society. I don’t want my sons to go through whole days when the only Black person they see is me. That’s not helpful (just as I wouldn’t want them to go a whole day where the only White person they see is their Father). It is hard to reconcile the fact that while I’ll be helping their education by putting them in good, stable, functional, high-performing schools, I’ll be hurting them at the same time by putting them in grossly segregated schools. It’s an injustice. I don’t know what I’m going to do. It’s sad that there aren’t more organizations for Parents of Color up here to help navigate this. More parent advocacy for our children will mean better communities of learning for our children (within school districts, intra-school districts…). It’s awful. Hopefully, by Friday, I’ll be a little less frustrated. Next Post Ain’t I Worth Saving? As for the diversity of the schools…good for you! I think more parents should make the education of their children a bigger deciding factor in a home purchase than the size of the pool! You’re a great mom! It’s so funny. Houses up here that would go for like 450k in Maryland go for some 750k up here in Massachusetts simply because of the school system. It’s genius. Making school systems go by town ensures that property values go through the roof (and then it is a cycle–good schools, high property rates. High property rates keep out potential pupils who, statistically based on various historical variables, may lower the test scores of the school districts, thus creating ridiculously highly rated schools.) It’s an awful game. And it makes segregation easy, pervasive, and inarguable. It makes me want to pull my hair out.